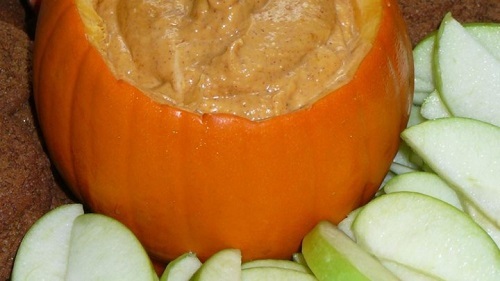 This sweet dip is a great appetizer for your Halloween and Thanksgiving events. 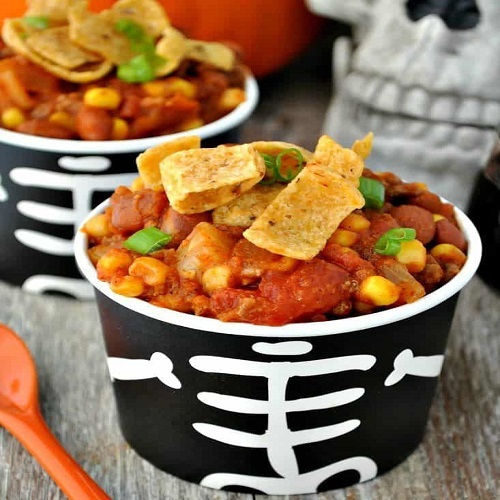 Serve with apple slices, ginger snaps, pretzels, graham crackers, whatever makes you happy! In a medium bowl, blend cream cheese and confectioners’ sugar until smooth. Gradually mix in the pumpkin. Stir in the cinnamon, pumpkin pie spice, and orange juice until smooth and well blended. Chill until serving. 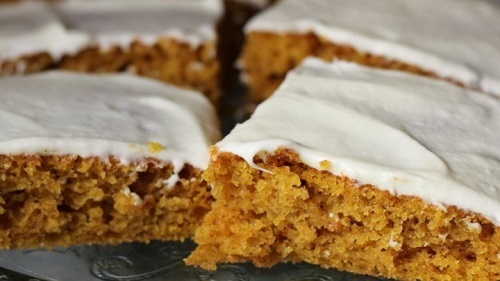 These are very moist and always are gone quick! In a medium bowl, mix the eggs, sugar, oil, and pumpkin with an electric mixer until light and fluffy. Sift together the flour, baking powder, baking soda, cinnamon and salt. Stir into the pumpkin mixture until thoroughly combined. Spread the batter evenly into an ungreased 10×15 inch jellyroll pan. Bake for 25 to 30 minutes in preheated oven. Cool before frosting. To make the frosting, cream together the cream cheese and butter. Stir in vanilla. Add confectioners’ sugar a little at a time, beating until mixture is smooth. Spread evenly on top of the cooled bars. Cut into squares. Can’t leave the pooches out of the pumpkin fun! Blend all 3 until smooth. Pour into ice cube trays – freeze for 12 hours. 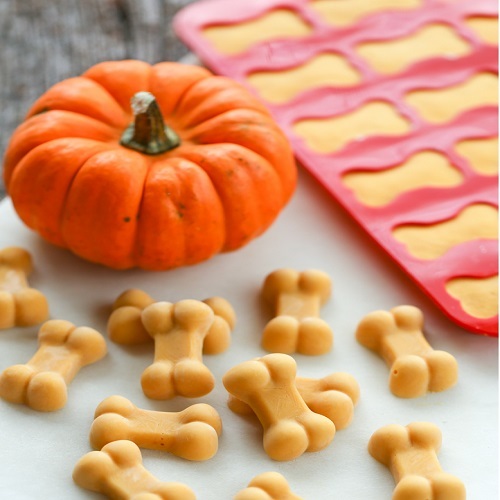 Pop single cubes into their food dish for a seasonal treat. Experience polenta in a whole new way! Preheat the oven to 350 degrees. Line a 9-x13-inch cake pan with parchment paper and set aside. In a large oven-safe saucepan heat oil over medium heat. Add onion and cook for 4 to 5 minutes or until they begin to turn translucent. Reduce the heat to low. Add garlic and sauté for 1 to 2 minutes, stirring constantly to prevent burning. Turn heat back up to high. Add stock and bring to a boil. Gradually add the cornmeal, a little at a time, whisking to combine after each addition. Place in oven and cook for 35 to 40 minutes or until mixture is creamy, stirring every 10 minutes to prevent lumps from forming. Remove from oven. Add butter, salt, pepper, and cheese. Using a large spoon, stir mixture together until butter and cheese is melted and all ingredients are thoroughly combined. Pour polenta into the cake pan, cover and place in the refrigerator until completely cooled. To serve, heat a gas grill (or non-stick sauté skillet) over medium heat. Remove polenta from the refrigerator and turn out onto a clean cutting board. Using a sharp knife, cut into square, round, or triangle shapes. Using a pastry brush (or spray oil), coat each side of the polenta cakes with oil. Place on the hot grill and cook until heated through and grill marks are evident. Remove from grill and transfer to a serving platter. Serve warm. Serve these savory “cakes” topped with roasted red pepper slices that have been tossed in a bit of balsamic, olive oil, salt, and pepper…..and friends, you have a beautiful side dish (or dinner)!